Oh boy, I shouldn’t show my son this post because for some reason, he’s fascinated with lighters. Mind you, he’s only 12. He has one of those Tesla coil lighters and he loves when he finds other types of lighters too. 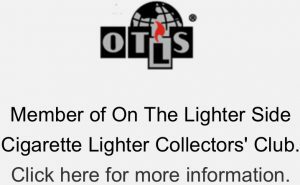 This is interesting because I didn’t realize there was a market for these types of lighters. Is this something you would typically use, or just display? Thank you for the comment, Christina. I use Beattie Jet and other petrol lighters on a regular basis after making a conscious decision to try to limit the amount of plastic I consume. The Beattie Jet’s versatility and durability mean that for as long as we can find them, they are a valuable tool for anyone who smokes cigarettes as well as pipes. They’re not being manufactured any longer though, so you better grab them when you can. So are these quite similar to Zippo lighters then? 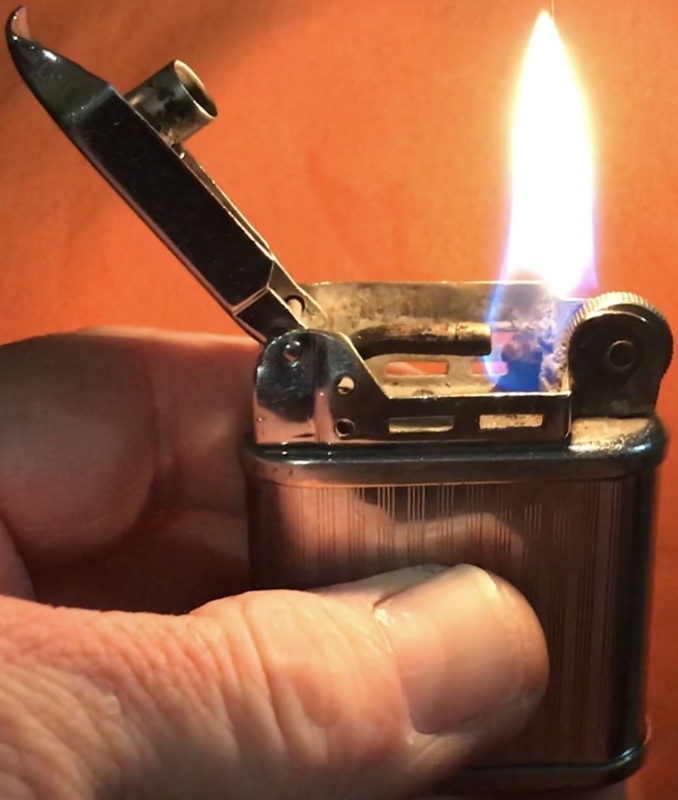 As an ex-smoker, I used to love my Zippo lighter, trying to open it, light it and shut it -all with one hand and one knee trick! So won’t be any use to me now, although these Beattie Jet lighters would make a great gift for any smoker. Thank you, Teresa. Yes, the Beattie Jet Lighter is very similar to a Zippo, just with the added ability to shoot an aimable jet flame. 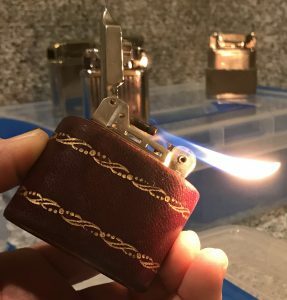 I know lots of people who will love this as it seems that there is a better quality lighter with the Beattie Jet as its more expensive. Why do you think it is under appreciated, is it because people don’t realise how good it is until they buy one? Thanks for the comment, Glenford. 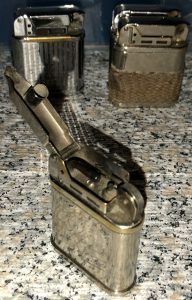 I think the Beattie Jet Lighter is underappreciated for many of the same reasons that its current market value is relatively high. It was made for a short period of time, early/mid 1940s-1961. Folks have become enamored with convenience which results in many consumers forgoing anything that is not cheap or disposable. Any kind of spike in interest for these lighters will send prices skyrocketing because there are so few of them lurking about. There is one perfect option available if the jet tip hole becomes clogged; obtain & use a fine acupuncture needle. It is a perfect fit to remove any clogging debris, additionally will not damage or widen the jet tip opening. I have one that belonged to my father, I sent it to NYC years ago to be repaired/restored as well as replated. The steel surface was worn down in many places to the underlying brass, from the years of my fathers heavy use as well as it being carried around in his pockets with change & other metal items. It looks great & still works perfectly to this day. Thanks for the tip, Herb and I’m glad to hear that you are still using your father’s Beattie Jet Lighter. 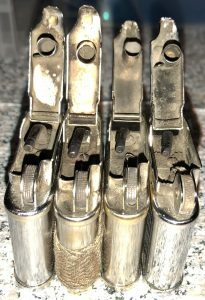 The hole in the jet tip of these lighters is not overly difficult to clean but damage to that tip will definitely affect the performance of the lighter. The probe that came with these lighters from the factory works great but lacking a probe, one must adapt. Thanks for sharing the story of your father’s lighter. 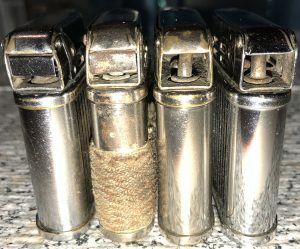 You can see my current inventory of Petrol/Jet Lighters here. Hey Joseph, do you have any recommendations on replacing the wick? My Beattie Jet lighter has no traditional wick and a very short (~5/8 inch) wick for the torch tube. I can’t find much info on replacing the wicks. Do you use one wick and run it into both ends or two wicks? How do you get the wick into the tube part? It seems like it would be very tough to do. Thank you for the questions, Riley. I use the wicks with the wire sticking out of them for the Beattie Jet Lighters. You can see a photo of the wick here. I think the Ronson type wicks will work too. I’ve rewicked several that had a separate, shorter wick in the end of the jet tube. As long as they function correctly, I leave them that way but I have used the bottom end of the flame wick for the terminal end of the jet tube when it needed replacing. It’s been a while since I’ve had to shove a wick into a jet tube but no, it wasn’t a lot of fun. Curved and bent dental picks and a lot of patience. I hope this helps. Let me know how it goes. Hello, Bob and thanks for the question. 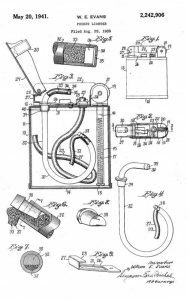 The Beattie Jet Lighter is a petrol lighter. As such, Zippo fuel and Ronsonol are probably the most widely available options. 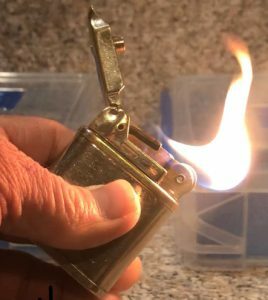 I generally use Zippo Lighter Fluid and it works just fine. 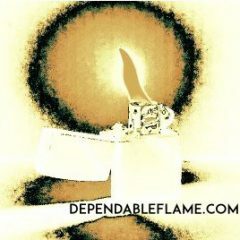 I’ve been intrigued with Beattie lighters since I stumbled upon your site. I just found one at local antique shop in Phoenix. Looks to be in goood shape lid hinge good, wick good, haven’t had a chance to open up flint tube to clean out and add flint and fluid. Lots of brass patina or chrome worn off looks nicely vintage. Any tips for cleaning and preparing? I’m not super handy. Planning to clean with 151 and maybe sanding pads? Hello, Jason. Thank you for the comment. Regarding cleaning, I don’t usually do anything more than wipe them off with a rag. Use lighter fluid or Everclear when I need a solvent to get through buildup or grime. I don’t sand or polish. I just try to clean them up the best I can without damaging what remains of the original finish. As far as preparation for use, the flint tube is usually the first obstacle. Once you get it sparking, if it looks pretty clean inside and up top then you might as well fuel it up and see how it works. If you run into trouble clearing the old flint or manipulating the “jet” flame, let me know and we’ll get you moving in the right direction. Hi, I just obtained my father’s Beattie and it hasn’t been used in years although from the exterior finish wear it must have been used heavily at one point. There is no spark or even resistance when the wheel is turned. Are replacement flints available? Also, the wick does not appear to be in the gas tube inside. Dad passed away 16 years ago and this was found tonight when my mother and I were sorting through things. It was in its original box with papers and the cleaning probe tool. It was the first gift m6 Mom ever gave my Dad and so I would like to get it working again. Thanks for the question, Wes. Assuming the flint wheel just spins freely, it is either missing the flint spring and screw or the old flint has seized in the tube but is not currently in contact with the flint wheel. Pull the case off the lighter and turn the top part upside down. Is the flint spring screw in place over the flint tube? If it is, the flint tube is obstructed and most likely can be drilled out. If it’s not, a replacement flint spring and screw will probably solve your problem. Also, I’m curious why you think the wick isn’t in the jet tube?